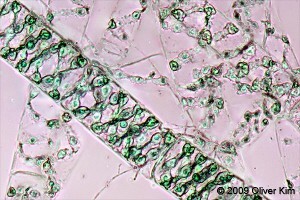 The image of Spirogyra is taken from a permanent slide. Several pictures were stacked and the contrast was enhanced. Spirogyra is the genus name of a fresh water algae, of which there are over 400 individual species. The spiral chloroplast is characteristic for this genus. The organism can be found in clean ponds of high nutrient content (such as due to fertilization of nearby fields). It then grows to form slimy filamentous masses of algae. Spirogyra is capable of reproducing both sexually and asexually. A filament may fragment into smaller pieces, each one capable of forming new cells. During sexual reproduction two cells align with each other and form congugation tubes which connect the two cells and allow for the exchange of genetic material, forming zygospores.